I’ll admit it: I have a marshmallow problem. I used to think they were so difficult to make, so I avoided them. I paid ridiculous prices for pretty little marshmallow cubes made at bakeries. There’s just somethin’ ’bout a square marshmallow, no? But once I discovered I could make them myself in about 15 minutes, I’ve made them dozens of times since. I started with vanilla bean marshmallows. Then, I went to chocolate marshmallows. Now? We’re at mixed berry marshmallows. I was hoping these would come across a little more ‘red-white-and-blue’ for your Fourth of July festivities this weekend, but it really just came across as purple and white. And I’m okay with that because they taste so dang good. Sometimes, you even get a pocket of a whole juicy blueberry and I think that’s pretty close to Fourth of July. We have a super busy Fourth of July. We have our entire family in town for Camille’s baptism! I can’t wait! I wish I had the energy to make a huge meal for everyone, but honestly, we’re having it catered. My energy level isn’t back to 100% yet, plus breastfeeding and pumping take up so many hours in my day. So, I had to settle for a catered lunch. HOWEVER, you better believe I’m making homemade desserts. I’ll have piles of these mixed berry marshmallows for making s’mores, and I also plan on making banana pudding. If you need me on Saturday, I’ll be making banana pudding in as many dishes as I can find in my house. I’m just going to keep stirring pudding and slicing bananas until all of the casserole dishes, bowls, and baking pans in my entire house are filled. You can never have enough banana pudding. S’mores and banana pudding. It’s going to be a happy Fourth indeed! Stay safe, friends! In a small sauce pan, cook the blueberries with the lemon juice and 1 teaspoon of the sugar until thickened, about 5 minutes. Meanwhile, mash the strawberries in a small bowl with the remaining tablespoon of sugar. Next, make the marshmallows: In a medium sauce pan, stir together the granulated sugar, corn syrup, salt, and 3 tablespoons of the water. Turn the heat to high and bring to a boil without stirring. Clip a candy thermometer to the edge of the pan, and boil until it reaches 238-degrees Farenheit. Beat the mixture for a full 10 minutes. Stir in the vanilla extract or vanilla bean seeds and mix until combined. 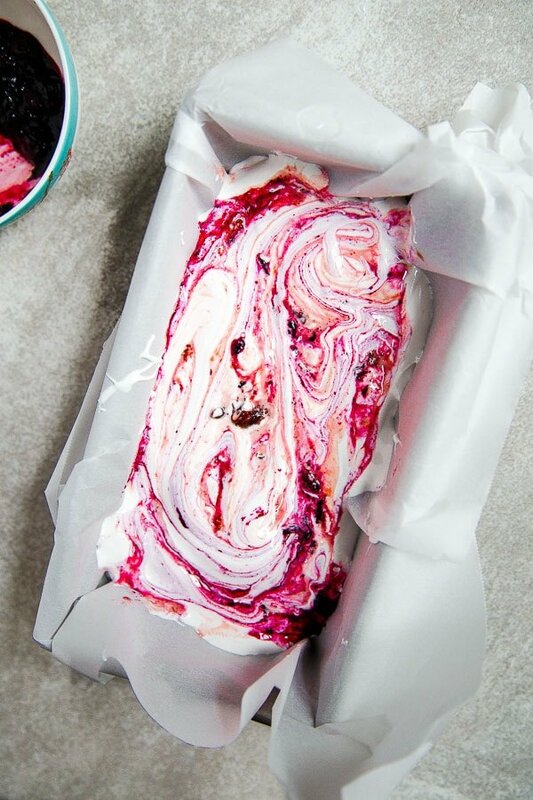 Spread the mixture into a 9 x 5" loaf pan that has been lined with parchment paper and greased very well with either cooking spray, butter or oil. Next, swirl the blueberry and strawberry mixture into the marshmallows with a knife. Try to avoid adding the liquid from the strawberries and just aim for the berry pieces. Store the marshmallows in an air-tight container at room temperature. They will keep for 2-3 days. To make the s'mores, heat the marshmallow over an open flame until toasted to your liking. 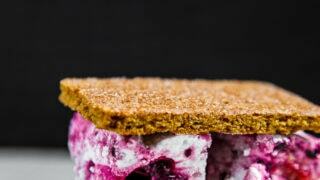 Sandwich between two graham crackers, using white chocolate as the 'glue.' Serve immediately. Have a lovely time with your family dear! I’ve been trying a homemade vegan marshmallow for so long to no avail, but these will just keep me pining away! Those are seriously the prettiest marshmallows around! I think it’s great you are taking some time from cooking to enjoy the day. Let someone else cook the meal! Of course desserts this pretty and banana pudding are kind of perfect and so you, so you have to do dessert! They are both great for doing the day before! I think this looks perfect for the 4th! I haven’t tried marshmallows before but yours are gorgeous. Pinning! I’m seriously considering going and buying a small fire pit for our deck so I can have an excuse to make these marshmallows this weekend! They are absolutely perfect! SWOON!!! Holy smokes, girl!! So yummy. I’m not the biggest s’mores fan but I could definitely devour these! Yum!! THOSE MARSHMALLOWS!!! I just can’t deal with how perfect they are. You made a perfect baby and then found the time to make perfect marshmallows. HOW?! Love this post friend! Loving the homemade marshmallows and the use of white chocolate! These looks absolutely delicious, pinning! What type of graham cracker did you use? Was it just a generic kind or a specific brand? I’m trying to find a different brand than Honey Maid! Looking forward to making these eye-grabbing marshmallows! have a great weekend with the familia :) and these berry marshmallow sounds wonderful,,something i would have never thought of. Wow, these s’mores look great. 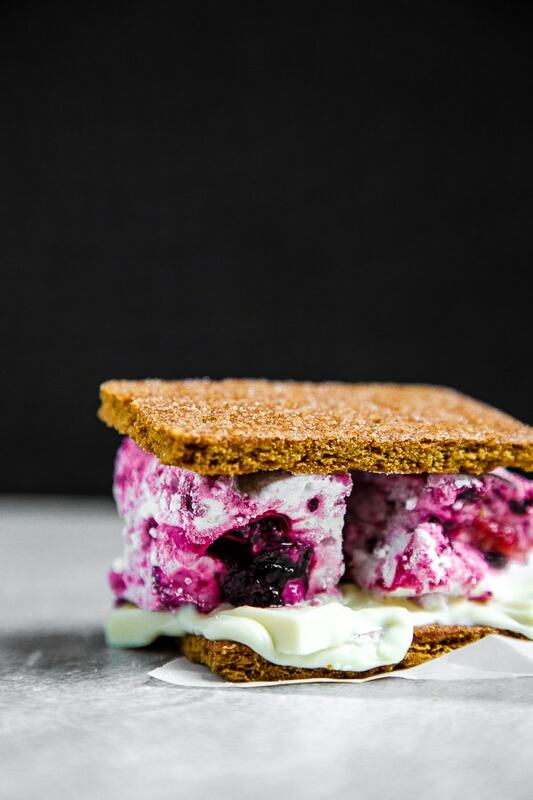 I tried making some marshmallows once and failed miserably – I think these berry marshmallows are gonna get me back on that horse! They look amazing! These are nothing short of gorgeous! Have a wonderful fourth and baptism! Oh yummy!! These look oh so good!! Have fun on the 4th!! Out of curiosity, why a hand mixer and not a stand mixer? These look amazing! The amount of ‘batter’ is too small for a stand mixer. The beater would hardly touch the marshmallow mixture. 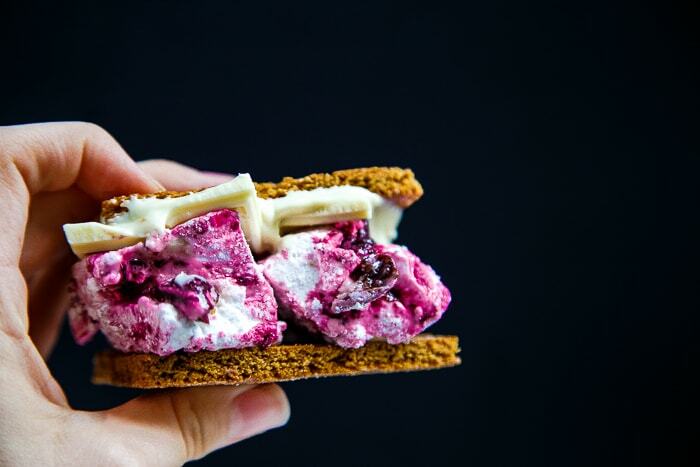 These s’mores look delightful! I’m loving the pretty berry marshmallows and melty white chocolate. I’ve never made my own marshmallows, but you’re selling me on the simplicity. Pinned! I’m so glad I found you via Pinterest! Your desserts look wonderful! I have a couple of questions about this recipe. Could I omit the strawberries and just add a similar weight in blueberries? Is there a decent substitution for corn syrup, in marshmallows? I don’t know if it would change the overall consistency of them, I was hoping you’ve tried. Or could at least point me in the right direction. Sure, sub all blueberries if you like. And no, unfortunately, there is not a substitution for corn syrup in marshmallows. It’s the only thing that reaches the proper temperature to set the crystalline structure of sugar. I have seen some recipes for marshmallows made with maple syrup online, though. I would search for an alternate marshmallow recipe, honestly. This recipe won’t work with substitutions. Sorry! yes. those look superb. we love all things berry. those are taking it to a new level.